Strategic Marketing Planning Advice from Top Marketers—third and final in an exciting Three-Part Blog Series! Different companies have their own ways of creating their marketing plans, from what they focus on to how long they spend in the planning process. One thing is certain: an actionable strategic marketing plan is essential for every B2B company looking to improve its marketing success. But, what makes a marketing plan ‘actionable’ and ‘strategic’? We asked top marketers from LinkedIn group Chief Marketing Officer [CMO] Network to chime in and share. 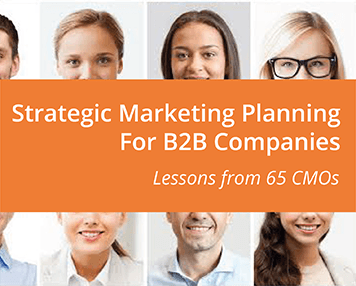 We compiled this advice in our latest whitepaper, “Strategic Marketing Planning for B2B Companies- Lessons from 65 CMOs” where we grouped learnings into ten lessons. The third most important piece of advice (click to read first and second) is to brutally honest about your business reality. While it's good to have lofty goals, companies should also be realistic about their starting point and know their limitations. We at Mezzanine have a couple of tried and true exercises to assess “reality” while building a marketing plan. The first is to conduct a SWOT analysis of the company relative to the marketplace. This gets everyone on the same page in terms of where to focus and also helps to shape messaging. It’s also an effective way to address general business issues that may get overlooked during people’s busy work schedule. Another excellent way to assess the current business environment is to conduct research on the competition. Not only will you better understand what you’re up against in terms of messaging and marketing activities, but oftentimes you get ideas for content, website layout, events to participate in, and different calls to action. This is just one of ten valuable lessons that leading marketers have shared. Learn about the other lessons by downloading our white paper now.